While it’s not intentional, there’s a big population of lacrosse coaches out there who are actually hurting the development of their goalies. With the growth of the sport of lacrosse, many teams find themselves with head coaches with very little experience. It’s a tough task then to expect that the majority of teams would have an experienced coach who is knowledgeable in how to properly advance their lacrosse goalie’s skills and mental talents. Simply because you were never a goalie doesn’t give you a good excuse to neglect the goalies. For example, some head coaches played defense in their playing days and yet have no problem teaching man-up strategy. This post is a collection of mistakes I’ve seen coaches make when it comes to the development of the goalie. Think of this as a list of things to avoid if you want your goalie to reach his/her full potential. It’s 12 ways to destroy your lacrosse goalie’s development. Goalies are not like other players. It’s a specialty position and must be coached as such. The good news is you don’t need goalie experience to be a great goalie coach. Sure it helps, but nowadays with Instagram, YouTube, and websites like LaxGoalieRat (my book or my camp lays out everything), there is really no excuse to be ignorant on how to coach a goalie. As a head coach, if you don’t have a dedicated lacrosse goalie coach, I recommend you assign the responsibility to an assistant coach or a parent. Once the coach learns some basic principles of a lacrosse goalie stance, positioning, arc play and save techniques, they can begin to intelligently observe and critique your goaltenders so that they learn and memorize the proper form. Can’t recognize things on the fly? Record them during practice or games and watch the tape in slow motion. Bad habits will become amplified in slo-mo. Coaches who provide no one-on-one instruction with goalies during practice are hurting their development. Goalie is the most important position on the team (in my biased opinion, anyway) so a coach cannot be so busy with the attack and defense that they don’t have time to dedicate to the most important position on the field – the goalies. Nothing is harder than being burdened with the expectations of an MLL goalie when you are incapable of executing the saves at that level. When you scream and yell at the goalies for mistakes, are you being fair? Is the goalie experienced enough to make the type of saves you are demanding? Be fair and teach them responsibility for plays they can control and wisdom to know what type of scoring situations they aren’t yet capable of handling. As a coach, we cannot expect our goalies to stop every shot in practice. Setting unrealistic objectives in practice and letting them know when they fail to live up to these objectives will cause many goaltenders to break down mentally. I know because I receive a lot of emails from goalies who feel like losses are their fault and it’s ruining their lacrosse experience. To properly ensure goaltenders develop, try to aim for a save percentage that is realistic for the goalie’s skill level and experience. This is the most common and ridiculous problem for goalies. How many times does the referee blow the whistle and line up players in an arc and let them blast away rapid-fire shots at the goalie? This is what some coaches consider “goalie practice”. If you can’t identify exactly what skill you are developing in the goalie (other than lots of shots), then the drill is for the shooters – NOT the goalie. I’m 100% for goalies facing shots during drills in practice, no problem with that. However, if they are going to face shots it should be a realistic situation. Shooters have to move their feet, be defended, change speeds, deal with a harassing defenseman, etc. These concepts will improve their scoring ability and make sure the goalies are developing too. If you’re doing a shooting drill with no defense put a cone down on the ground and tell offensive players they must shoot before that cone. That way, middies and attackman don’t crank unrealistic shots at the keeper. Alternatively, if the purpose of the drill is purely to improve shooting consider having the goalies perform a workout on their own instead of standing in the cage as targets. 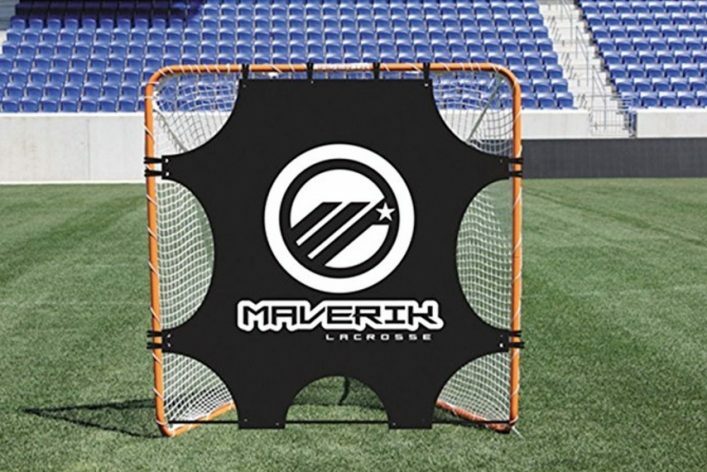 You can buy a goal target to attach to the lacrosse goal in shooting drills so players can practice hitting the right zones. Avoiding unrealistic situations will help the goalie keep a good attitude during practice. In the clearing game and even for making saves, a goalie’s stick skills are very important. Therefore, in addition to lots of wall ball sessions, every once in a while goalies should participate in the team’s line drills. Many coaches let the goalies perform their own warmup while the rest of the team performs line drills. Unsupervised some goalies tend to go through the motions or repeat bad habits during this time. This relates to the 1st item I wrote about being neglected. Goalies included in line drills learn to catch, throw, fake, and dodge. All crucial skills to know when you’re leading the clear. Therefore be sure to include your goalies in lines drills every so often. When a goalie makes a mistake it directly leads to a goal for the other team. So it’s very easy to put the blame on the goalie when your team gets scored on. But never forget that its a team game. The attackman who threw the ball away losing possession is just as guilty for the subsequent goal as the keeper who let one slip by. The middie who missed the second slide is just as guilty as the goalie who allowed in a 10 yard step down shot. Goalies tend to have broad shoulders when it comes to accepting blame for losses or goals. As a coach you cannot add to that. It will destroy their confidence and ultimately their development in the cage. Coaches who lay the difference between winning and losing solely upon the goaltender are not doing them any favors. A coach who makes it clear to everyone that the goaltender’s performance is the difference between winning and losing puts an incredible amount of pressure on that goaltender. Goalies have enough pressure on them as if. If anything, the coach should be trying to lift pressure from a goaltender’s shoulders so he can concentrate more effectively on the game. Remember, too much pressure makes a goaltender too tense and stiff, and that is the exact opposite of how we want our goalies to play. Goalies need to know what you, as a coach, think of them. They need to know what they must do to improve their skills to earn that starting role or advance to the next level. You will develop “head case” goalies by ignoring them, not telling them who is playing or benching them from the start without first having a one-on-one chat about the decision. Communication with a goalie must be open and honest. I never want a goalie to be coddled but simply be honest with them as to your expectations and you will have fewer headaches. As a coach, part of your responsibility is to push your team to give its max effort. That must also be true about your goalie. The full extent of training a goalie for some teams means they send an attackman and the goalie down to the far end of the field to take shots. Seeing shots helps but there is so much more you could be doing to train a goalie. So many more lacrosse goalie drills that develop their hands, their eyes, their quickness, their physical stamina, etc. I also know plenty of kids that when left to train themselves will not push as hard as is needed to become a champion. Remember that in the elite lacrosse goalie triad, a goalie must also be physically trained so their body is explosive to the ball. If you’re underworking them physically, their game will suffer. If your goalie is not getting pushed to exert maximum effort you are doing them a disservice. In the same way you motivate, encourage, and sometimes discipline your team, the goalie must also receive this same type of motivation, encouragement, and discipline. For a goalie to improve, they need to get out of their comfort zone. The fact is when we’re performing drills goalies should NOT be saving 100% of the shots. That to me indicates that you are shooting unrealistically slow. Shoot for something more in the 70% range so that goalies don’t get discouraged but at the same time they’re seeing realistic speeds that will help them improve. We’re also coaching them to shrug off goals given up and approach the next save with the same high level of enthusiasm as always. You also must encourage them to work on their weaknesses even though they may hate it. Many goalies struggle with off-stick hip or bounce shots. And even though they may fail tremendously those weaknesses must be addressed through coaching proper technique and then reinforcing that technique via drills. Lots of coaches understand the part about turning goalies into great ball stoppers. But there is another piece of an elite lacrosse goalie and that is they are mentally tough. Leaving a goalie to figure out mental toughness on his/her own is a big mistake. Their young, developing minds go in a million directions and it usually ends with self-blame and doubt. As a coach, take time to develop your goalie mentally. Teach them anecdotes like the Tale of Two Wolves. Teach them how to act after giving up a goal. Teach them traits of the mentally elite goalies. Teaching a goalie to be mentally strong is just as important as teaching them the proper save technique. Welcome to modern lacrosse. Goalies must handle the ball outside of the crease. If you do not train your goalie to be a great stick handler their game will suffer. Your team’s clears will suffer. Leaving the crease doesn’t mean they’re sprinting into the offensive zone every clear. But it does mean and they have the freedom (and the talent) to lead a clear on foot or to chase out a shot. It means they feel comfortable juking a riding attack when the situation calls for it. There is also a strong correlation between stick skills and save ability so by working on their handling, they’re working on saves too. There are a lot of different styles of lacrosse goaltending. Some goalies exceed with a flat arc while others thrive in a normal arc. Some goalies prefer stepping laterally vs. stepping to the shot at the 45. Some goalies setup a little more upright in their stance while others prefer a deeper knee bend. Some goalies setup with high hands (thumb around the eye) while others have the top hand lower around the chin. Some goalies setup in their stance with a vertical stick while others have it angled. The point is there isn’t 1 specific way to play and coaches who think there is and force their own style onto a goalie who is already accustomed to playing another way, are ultimately doing their goalie a disservice. Some coaches have a “my way or the highway” attitude when they inherit a goalie. And for some general things, like the level of effort expected, hustle or the communication used with the team, this is fine. But for other things like stance and arc play, I think a coach needs to work with a goalie’s individual style, not force his/her own style onto a goalie who is used to playing and having success another way. While every coach I’m sure has great intentions, some coaching styles and tactics are not good for a lacrosse goalie’s development. If you’re wondering how to avoid hurting your lacrosse goalie’s development, this list is for you. Avoid these 12 items and your lacrosse goalie should continue on a great path of development. Any items I missed? What would you recommend lacrosse coach do (or do not do) to improve their lacrosse goalie’s development? Leave me a comment down below. Allelujah!! As a parent i have witnessed 1st hand how a coach can Destroy your kids skill set all because they won’t admit they do not know how to coach goalies. I’ve paid A LOT of $ for Top Goalie Coaches/Goalie Camps only to hear my daughter’s high school coach reprimand her and tell her she’s not performing, doing things wrong but yet the coach doesn’t even believe in warming up a Goalie properly. I tend to hold value in what my daughter has learned from Devon Wills, Caylee Waters and Coach Mary Schwartz. Good points Deanna. I added a 12th way which is ‘my way or highway’ approach to coaching goalies. Super stuff here! The goalie IS the most important player. Period. I tell this to goalies I coach. I tell them they are the quarterback. The offense starts with them. They need to embtace the role of a leader (in their own way) and be vocal. You’re welcome Craig. Thanks for that comment! I feel that something else that coaches don’t do all the time is having their goalies back. I’ve been on teams where it’s all about scoring, never having a defensive minded strategy, and just letting the offense rip on the goalie; wether it be verbally yelling at the goalie for something, or just letting them unload a shot right at the doorstep. It’s as much about as the coach including a goalie and letting them grow, as it is making the goalie a valued member of a team. Goalies have not only one of the most important jobs on the field, but one of the most difficult; I’ll say 98% of a team wouldn’t ever think about stepping in the cage and taking some real shots, and yet (in some cases) will bag on a goalie for something or put their goalie in an unsafe position. This is my first year being a goalie and this (and everything else on your blog) is really helpful to setting up a good warm up and suggestions for my coaches at practice. Thank you for the quality advice! You’re welcome Madeline. Good luck in goal this year! Great article!! My son has been a goalie for 4 years now. He hit the U15 curve where you have to get better quickly as size, speed and practice crank drills increase rapidly. Most of the deep yellow ball welts on his shoulders and shins have come from town or camp coaches (not his club goalie coach, who is fantastic!) who seemed frustrated that he could stop a good portion of their shots. He hasaso had several high schools ask if he would switch schools to develop their HS goalie pipeline. He shared with us last night that the welts and crease cranks drills are frustrating but are manageable. His team mate’s negative comments (and relayed parent’s comments!) are simply too much pressure. He has decided to not play goalie any longer. He is done. He is decent at other positions, but he has stood out as a goalie. It’s sad he is ending this chapter, but loves the game and wants to play. His mom and I will support him, just frustrated that the pressure from within his own team impacted his desire to play a position that is hard enough to play by itself. Hi J – That is frustrating. I wish his teammates would spend a little time in goal, then they’d develop a little more respect. Lacrosse culture respects that goalie and its a shame when teams ignore this part of the game. Because you’re right, the position is hard enough as it is without the adding pressure and criticism. Thanks Mike. Don’t know of any goalie coaches in that area.